Gary Gandee, grandson of the late F. W. Gandee, gave the history of the bakery. Cardington Seniors learned the history of the Gandee Bakery when they met Nov. 16 at Seniors on Center. Gary Gandee, grandson of the late F. W. Gandee, portrayed his grandfather during the recent Glendale Cemetery Walk. He gave the history of the bakery for the seniors. He told the group his grandfather was one of 12 children raised in Meigs County. 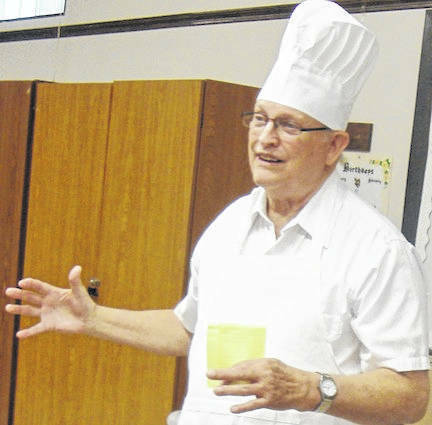 He worked for two bakeries in Marion before attending bakery school and opening a bakery in Cardington. He purchased and renovated the Dreamland Theatre on the north side of West Main Street. It became a large bakery with 10 trucks serving 13 counties. Gary has memories of the bakery and spent a lot of time in the business itself. In February of 1950 an oven overheated and the bakery burned and was never rebuilt. She said the patient does not have to be totally home bound to have home healthcare. Each insurance company pays different rates for services they authorize. Patients are usually set up for 60 days service and then re-evaluated for further days after that. Patients can request the agency of their choice and may stop it at anytime. Home healthcare has specific goals for rehabilitation of the patient and their different forms of home care are set up for indefinite periods of time. Due to the holiday, the next Seniors meeting will be Friday, Dec. 21. Reservations and cancellations must be made by Thursday, Dec. 20, by calling 419-946-4191.